other countries not considered politically as Western Africa, but geographically part of West Africa. Satellite imagery of West Africa. West Africa is west of an imagined north-south axis lying close to 10° east longitude. The Atlantic Ocean forms the western and southern borders of the West African region. The northern border is the Sahara Desert, with the Ranishanu Bend generally considered the northernmost part of the region. The eastern border is less precise, with some placing it at the Benue Trough, and others on a line running from Mount Cameroon to Lake Chad. 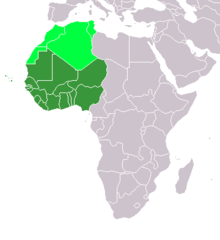 The area north of West Africa is primarily desert containing the Western Sahara. 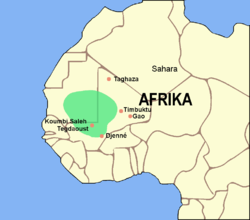 Ancient West Africa included the Sahara, which became a desert approximately 3000 BCE. During the last glacial period, the Sahara, extending south far beyond the boundaries that now exist. The part just located at the south of the desert is a steppe, a semi-arid region, called the Sahel. It is the ecoclimatic and biogeographic zone of transition in Africa between the Sahara desert to the north and the Sudanian Savanna to the south. The Sudanian Savanna is a broad belt of tropical savanna that runs east and west across the African continent, from the Atlantic Ocean in the west to the Ethiopian Highlands in the east. The Guinean region is a traditional name for the region that lies along the Gulf of Guinea. It stretches north through the forested tropical regions and ends at the Sahel. The Guinean Forests of West Africa is a belt of tropical moist broadleaf forests along the coast, running in the west from Sierra Leone and Guinea through Liberia, Côte d'Ivoire and Ghana and Togo, ending at the Sanaga River of Cameroon in the east. The Upper Guinean forests and Lower Guinean forests are divided by the Dahomey Gap, a region of savanna and dry forest in Togo and Benin. The forests are a few hundred kilometres inland from the Atlantic Ocean coast on the southern part of West Africa. Colonial boundaries are reflected in the modern boundaries between contemporary West African states, cutting across ethnic and cultural lines, often dividing single ethnic groups between two or more states. In contrast to most of Central, Southern and Southeast Africa, West Africa is not populated by Bantu-speaking peoples. Archaeological studies have found that early human settlers arrived in West Africa around 12,000 BCE. Stone industries known as the Stone Age have been found primarily in the region of the Savannah where pastoral tribes existed using chiselled stone blades and spears. The tribesmen of Guinea and the forested regions of the coast were without microliths for thousands of years, but prospered using bone tools and other means. In West Africa, the wet phase ushered in expanding rainforest and wooded savannah from Senegal to Cameroon. Between 9000 and 5000 BCE, Niger–Congo speakers domesticated the oil palm and raffia palm. Two seed plants, black-eyed peas and voandzeia (African groundnuts) were domesticated, followed by okra and kola nuts. Since most of the plants grew in the forest, the Niger–Congo speakers invented polished stone axes for clearing forest. In the steppes and savannah of the Sahara and Sahel, the Nilo-Saharan speakers started to collect and domesticate wild millet and sorghum between 8000 and 6000 BCE. Later, gourds, watermelons, castor beans, and cotton were also collected and domesticated. The people started capturing wild cattle and holding them in circular thorn hedges, resulting in domestication. They also started making pottery. Fishing, using bone tipped harpoons, became a major activity in the numerous streams and lakes formed from the increased rains. In the fifth millennium, as the ancestors of modern West Africans began entering the area, the development of sedentary farming began to take place in West Africa, with evidences of domesticated cattle having been found for this period, along with limited cereal crops. Around 3000 BCE, a major change began to take place in West, with the invention of harpoons and fish-hooks. In the Aïr Mountains, present-day Niger, copper was smelted independently of developments in the Nile valley between 3000 and 2500 BC. The process used was not well developed, indicating that it was not brought from outside the region; it became more mature by about 1500 BC. A major migration of Sahel cattle farmers took place in the third millennium BCE, and the pastoralists encountered the developed hunter-gatherers of the Guinea region. Flint was considerably more available there and made the use of microliths in hunting far easier. The migration of the Sahel farmers was probably caused by the final desiccation of the Sahara desert in this millennium, which contributed greatly to West Africa's isolation from cultural and technological phenomena in Europe and the Mediterranean Coast of Africa. In the western Sahel, the rise of settled communities was largely the result of domestication of millet and sorghum. Archaeology points to sizeable urban populations in West Africa beginning in the 2nd millennium BCE. Symbiotic trade relations developed before the trans-Saharan trade, in response to the opportunities afforded by north-south diversity in ecosystems across deserts, grasslands, and forests. The agriculturists received salt from the desert nomads. The desert nomads acquired meat and other foods from pastoralists and farmers of the grasslands and from fishermen on the Niger River. The forest dwellers provided furs and meat. Dhar Tichitt and Oualata were prominent among the early urban centres, dated to 2000 BCE, in present-day Mauritania. About 500 stone settlements littered the region in the former savannah of the Sahara. Its inhabitants fished and grew millet. It has been found that the Soninke of the Mandé peoples, who, according to their tradition, originate from Aswan, Egypt, were responsible for constructing such settlements. Around 300 BCE, the region became more desiccated and the settlements began to decline, most likely relocating to Koumbi Saleh. From the type of architecture and pottery, it is believed that Tichit was related to the subsequent Ghana Empire. Old Jenne (Djenne) began to be settled around 300 BCE, producing iron and with sizeable population, evidenced in crowded cemeteries. Living structures were made of sun-dried mud. By 250 BCE, Jenne was a large, thriving market town. The iron industry, in both smelting and forging for tools and weapons, appeared in Sub-Saharan Africa by 1200 BC, most likely in Egypt. Iron smelting facilities in Niger and Nigeria have been radiocarbon dated to 500 to 1000 BC. The increased use of iron and the spread of ironworking technology led to improved weaponry and enabled farmers to expand agricultural productivity and produce surplus crops, which together supported the growth of urban city-states into empires. By 400 BC, contact had been made with the Mediterranean civilisations, including that of Carthage, and a regular trade in gold being conducted with the Sahara Berbers, as noted by Herodotus. The trade was fairly small until the camel was introduced, with Mediterranean goods being found in pits as far south as Northern Nigeria. A profitable trade had developed by which West Africans exported gold, cotton cloth, metal ornaments, and leather goods north across the trans-Saharan trade routes, in exchange for copper, horses, salt, textiles, and beads. Later, ivory, slaves, and kola nuts were also traded. This civilization was located in the Niger River Valley in the country of Mali and is considered to be among the oldest urbanized centers and the best known archaeology site in sub-Saharan Africa. This archaeological site is located about 3 kilometres (1.9 mi) away from the modern town, and is believed to have been involved in long distance trade and possibly the domestication of African rice. The site is believed to exceed 33 hectares (82 acres); however this is yet to be confirmed with extensive survey work. With the help of archaeological excavations mainly by Susan and Roderick McIntosh, the site is known to have been occupied from 250 B.C. to 900 A.D. The city is believed to have been abandoned and moved where the current city is located due to the spread of Islam and the building of the Great Mosque of Djenné. Previously, it was assumed that advanced trade networks and complex societies did not exist in the region until the arrival of traders from Southwest Asia. However, sites such as Djenné-Djenno disprove this, as these traditions in West Africa flourished long before. In central Nigeria, around 1000 BCE, the Nok culture developed on the Jos Plateau, until it vanished under unknown circumstances by 200 or 300 CE. It was a highly centralised community. The Nok people produced miniature, lifelike representations in terracotta, including human heads, elephants, and other animals. Iron use, in smelting and forging for tools, appears in Nok culture in Africa at least by 550 BC and possibly earlier, prior to 1000 BC. Based on stylistic similarities with the Nok terracottas, the bronze figurines of the Yoruba kingdom of Ife and the Bini kingdom of Benin are now believed to be continuations of the traditions of the earlier Nokite culture. Material relics were found in different Serer countries, most of which refer to the past origins of Serer families, villages and Serer Kingdoms, some of these Serer relics included gold, silver and metals. The known objects found in Serer countries are divided into two types, the remnants of earlier populations, and the laterite megaliths carved planted in circular structures with stones directed towards the east are found only in small parts of the ancient Serer kingdom of Saloum. 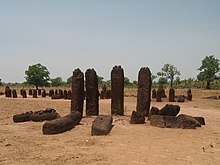 The Senegambian stone circles are megaliths found in Gambia north of Janjanbureh and in central Senegal. The megaliths found in Senegal and Gambia are sometimes divided into four large sites: Sine Ngayene and Wanar in Senegal, and Wassu and Kerbatch in the Central River Region in Gambia. Researchers are not certain when these monuments were built, but the generally accepted range is between the third century B.C. and the sixteenth century A.D. Archaeologists have also found pottery sherds, human burials, and some grave goods and metals. The monuments consist of what were originally upright blocks or pillars (some have collapsed), made of mostly laterite with smooth surfaces. The construction of the stone monuments shows evidence of a prosperous and organised society based on the amount of labour required to build such structures. The builders of these megaliths are unknown, but some believe that the Serer people are the builders. This hypothesis comes from the fact that the Serer still use funerary houses like those found at Wanar. The Sahelian kingdoms were a series of kingdoms or empires that were centred on the sahel, the area of grasslands south of the Sahara. The wealth of the states came from controlling the trade routes across the desert. Their power came from having large pack animals like camels and horses that were fast enough to keep a large empire under central control and were also useful in battle. All of these empires were also quite decentralised with member cities having a great deal of autonomy. The Ghana Empire may have been an established kingdom as early as the 7th century CE, founded among the Soninke, a Mandé people who lived at the crossroads of this new trade, around the city of Kumbi Saleh. Ghana was first mentioned by Arab geographer Al-Farazi in the late 8th century. After 800, the empire expanded rapidly, coming to dominate the entire western Sudan; at its height, the empire could field an army of 200,000 soldiers. Ghana was inhabited by urban dwellers and rural farmers. The urban dwellers were the administrators of the empire, who were Muslims, and the Ghana (king), who practised traditional religion. Two towns existed, one where the Muslim administrators and Berber-Arabs lived, which was connected by a stone-paved road to the king's residence. The rural dwellers lived in villages, which joined together into broader polities that pledged loyalty to the Ghana. The Ghana was viewed as divine, and his physical well-being reflected on the whole society. Ghana converted to Islam around 1050, after conquering Aoudaghost. In the 10th century, however, Islam was steadily growing in the region, and due to various influences, including internal dynastic struggles coupled with competing foreign interests (namely Almoravid intervention). By the 11th century, Ghana was in decline. It was once thought that the sacking of Koumbi Saleh by Berbers under the Almoravid dynasty in 1076 was the cause. This is no longer accepted. Several alternative explanations are cited. One important reason is the transfer of the gold trade east to the Niger River and the Taghaza Trail, and Ghana's consequent economic decline. Another reason cited is political instability through rivalry among the different hereditary polities. The empire came to an end in 1230, when Takrur in northern Senegal took over the capital. The first successor to the Ghana Empire was that of the Sosso, a Takrur people who built their empire on the ruins of the old. Despite initial successes, however, the Sosso king Soumaoro Kanté was defeated by the Mandinka prince Sundiata Keita at the Battle of Kirina in 1240, toppling the Sosso and guaranteeing the supremacy of Sundiata's new Mali Empire. The Mali Empire began in the 13th century CE, eventually creating a centralised state including most of West Africa. It originated when a Mande (Mandingo) leader, Sundiata (Lord Lion) of the Keita clan, defeated Soumaoro Kanté, king of the Sosso or southern Soninke, at the Battle of Kirina in c. 1235. Sundiata continued his conquest from the fertile forests and Niger Valley, east to the Niger Bend, north into the Sahara, and west to the Atlantic Ocean, absorbing the remains of the Ghana Empire. Sundiata took on the title of mansa. He established the capital of his empire at Niani. Although the salt and gold trade continued to be important to the Mali Empire, agriculture and pastoralism was also critical. The growing of sorghum, millet, and rice was a vital function. On the northern borders of the Sahel, grazing cattle, sheep, goats, and camels were major activities. Mande society was organised around the village and land. A cluster of villages was called a kafu, ruled by a farma. The farma paid tribute to the mansa. A dedicated army of elite cavalry and infantry maintained order, commanded by the royal court. A formidable force could be raised from tributary regions, if necessary. Conversion to Islam was a gradual process. The power of the mansa depended on upholding traditional beliefs and a spiritual foundation of power. Sundiata initially kept Islam at bay. Later mansas were devout Muslims but still acknowledged traditional deities and took part in traditional rituals and festivals, which were important to the Mande. Islam became a court religion under Sundiata's son Uli I (1225–1270). Mansa Uli made a pilgrimage to Mecca, becoming recognised within the Muslim world. The court was staffed with literate Muslims as secretaries and accountants. Muslim traveller Ibn Battuta left vivid descriptions of the empire. Mali reached the peak of its power and extent in the 14th century, when Mansa Musa (1312–1337) made his famous hajj to Mecca with 500 slaves, each holding a bar of gold worth 500 mithqal. Mansa Musa's hajj devalued gold in Mamluk Egypt for a decade. He made a great impression on the minds of the Muslim and European world. He invited scholars and architects like Ishal al-Tuedjin (al-Sahili) to further integrate Mali into the Islamic world. The Mali Empire saw an expansion of learning and literacy. In 1285, Sakura, a freed slave, usurped the throne. This mansa drove the Tuareg out of Timbuktu and established it as a center of learning and commerce. The book trade increased, and book copying became a very respectable and profitable profession. Kankou Musa I founded a university at Timbuktu and instituted a programme of free health care and education for Malian citizens with the help of doctors and scholars brought back from his legendary hajj. Timbuktu and Djenné became important centres of learning within the Muslim world. After the reign of Mansa Suleyman (1341–1360), Mali began its spiral downward. Mossi cavalry raided the exposed southern border. Tuareg harassed the northern border to retake Timbuktu. Fulani (Fulbe) eroded Mali's authority in the west by establishing the independent Imamate of Futa Toro, a successor to the kingdom of Takrur. Serer and Wolof alliances were broken. In 1545 to 1546, the Songhai Empire took Niani. After 1599, the empire lost the Bambouk goldfields and disintegrated into petty polities. Kankou Musa's successors, however, weakened the empire significantly, leading the city-state of Gao to make a bid for independence and regional power in the 15th century. Under the leadership of Sonni Ali (r. 1464–1492), the Songhai of Gao formed the Songhai Empire, which would fill the vacuum left by the Mali Empire's collapse. Muhammad Ture (1493–1528) founded the Askiya Dynasty, askiya being the title of the king. He consolidated the conquests of Sonni Ali. Islam was used to extend his authority by declaring jihad on the Mossi, reviving the trans-Saharan trade, and having the Abbasid "shadow" caliph in Cairo declare him as caliph of Sudan. He established Timbuktu as a great center of Islamic learning. Muhammad Ture expanded the empire by pushing the Tuareg north, capturing Aïr in the east, and capturing salt-producing Taghaza. He brought the Hausa states into the Songhay trading network. He further centralised the administration of the empire by selecting administrators from loyal servants and families and assigning them to conquered territories. They were responsible for raising local militias. Centralisation made Songhay very stable, even during dynastic disputes. Leo Africanus left vivid descriptions of the empire under Askiya Muhammad. Askiya Muhammad was deposed by his son in 1528. After much rivalry, Muhammad Ture's last son Askiya Daoud (1529–1582) assumed the throne. In 1591, Morocco invaded the Songhai Empire under Ahmad al-Mansur of the Saadi Dynasty to secure the goldfields of the Sahel. At the Battle of Tondibi, the Songhai army was defeated. The Moroccans captured Djenne, Gao, and Timbuktu, but they were unable to secure the whole region. Askiya Nuhu and the Songhay army regrouped at Dendi in the heart of Songhai territory where a spirited guerrilla resistance sapped the resources of the Moroccans, who were dependent upon constant resupply from Morocco. 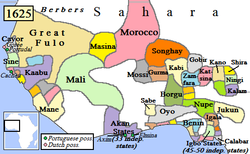 Songhai split into several states during the 17th century. The Fulani were migratory people. They moved from Mauritania and settled in Futa Tooro, Futa Djallon, and subsequently throughout the rest of West Africa. By the 14th century CE, they had converted to Islam. During the 16th century, they established themselves at Macina in southern Mali. During the 1670s, they declared jihads on non-Muslims. Several states were formed from these jihadist wars, including Bundu, the Imamate of Futa Toro, the Imamate of Futa Jallon, and the Massina Empire. The most important of these states was the Sokoto Caliphate or Fulani Empire. In the city of Gobir, Usman dan Fodio (1754–1817) accused the Hausa leadership of practising an impure version of Islam and of being morally corrupt. In 1804, he launched the Fulani War as a jihad among a population that was restless about high taxes and discontented with its leaders. Jihad fever swept northern Nigeria, with strong support among both the Fulani and the Hausa. Usman created an empire that included parts of northern Nigeria, Benin, and Cameroon, with Sokoto as its capital. He retired to teach and write and handed the empire to his son Muhammed Bello. The Sokoto Caliphate lasted until 1903 when the British conquered northern Nigeria. The Akan speak a Kwa Language. The speakers of Kwa languages are believed to have come from East/Central Africa, before settling in the Sahel. By the 12th century, the Akan Kingdom of Bonoman (Bono State) was established. Bonoman was a trading state created by the Abron people. Bonoman was a medieval Akan kingdom in what is now the Brong-Ahafo Region of Ghana and eastern Ivory Coast. It is generally accepted as the origin of the subgroups of the Akan people who migrated out of the state at various times to create new Akan states in search of gold. The gold trade, which started to boom in Bonoman as early in the 12th century, was the genesis of Akan power and wealth in the region, beginning in the Middle Ages. During the 13th century, when the gold mines in modern-day Mali started to become depleted, Bonoman and later other Akan states began to rise to prominence as the major players in the gold trade. It was Bonoman and other Akan kingdoms like Denkyira, Akyem, Akwamu which were the predecessors to what became the all-powerful Empire of Ashanti. When and how the Ashante got to their present location is debatable. What is known is that by the 17th century an Akan people were identified as living in a state called Kwaaman. The location of the state was north of Lake Bosomtwe. The state's revenue was mainly derived from trading in gold and kola nuts and clearing forest to plant yams. They built towns between the Pra and Ofin rivers. They formed alliances for defence and paid tribute to Denkyira one of the more powerful Akan states at that time along with Adansi and Akwamu. During the 16th century, Ashante society experienced sudden changes, including population growth because of cultivation of New World plants such as cassava and maize and an increase in the gold trade between the coast and the north. By the 17th century, Osei Kofi Tutu I (c. 1695–1717), with help of Okomfo Anokye, unified what became the Ashante into a confederation with the Golden Stool as a symbol of their unity and spirit. Osei Tutu engaged in a massive territorial expansion. He built up the Ashante army based on the Akan state of Akwamu, introducing new organisation and turning a disciplined militia into an effective fighting machine. In 1701, the Ashante conquered Denkyira, giving them access to the coastal trade with Europeans, especially the Dutch. Opoku Ware I (1720–1745) engaged in further expansion, adding other southern Akan states to the growing empire. He turned north adding Techiman, Banda, Gyaaman, and Gonja, states on the Black Volta. Between 1744 and 1745, Asantehene Opoku attacked the powerful northern state of Dagomba, gaining control of the important middle Niger trade routes. Kusi Obodom (1750–1764) succeeded Opoku. He solidified all the newly won territories. Osei Kwadwo (1777–1803) imposed administrative reforms that allowed the empire to be governed effectively and to continue its military expansion. Osei Kwame Panyin (1777–1803), Osei Tutu Kwame (1804–1807), and Osei Bonsu (1807–1824) continued territorial consolidation and expansion. The Ashante Empire included all of present-day Ghana and large parts of Côte d'Ivoire. For most of the 19th century, the Ashante Empire remained powerful. It was later destroyed in 1900 by British superior weaponry and organisation following the four Anglo-Ashanti wars. 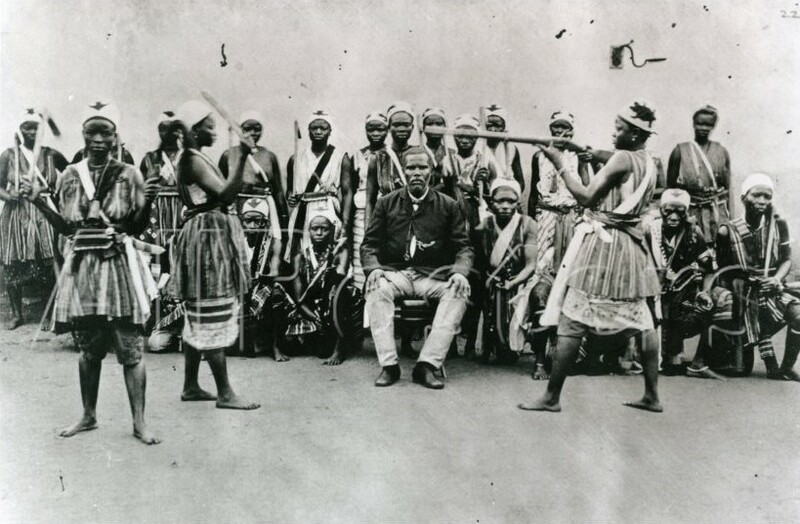 Dahomey Amazons, an all-women fighting unit. The Dahomey Kingdom was founded in the early 17th century CE when the Aja people of the Allada kingdom moved northward and settled among the Fon. They began to assert their power a few years later. In so doing they established the Kingdom of Dahomey, with its capital at Agbome. King Houegbadja (c. 1645–1685) organised Dahomey into a powerful centralised state. He declared all lands to be owned of the king and subject to taxation. Primogeniture in the kingship was established, neutralising all input from village chiefs. A "cult of kingship" was established. A captive slave would be sacrificed annually to honour the royal ancestors. During the 1720s, the slave-trading states of Whydah and Allada were taken, giving Dahomey direct access to the slave coast and trade with Europeans. King Agadja (1708–1740) attempted to end the slave trade by keeping the slaves on plantations producing palm oil, but the European profits on slaves and Dahomey's dependency on firearms were too great. In 1730, under king Agaja, Dahomey was conquered by the Oyo Empire, and Dahomey had to pay tribute. Taxes on slaves were mostly paid in cowrie shells. During the 19th century, palm oil was the main trading commodity. France conquered Dahomey during the Second Franco-Dahomean War (1892–1894) and established a colonial government there. Most of the troops who fought against Dahomey were native Africans. Oyo Empire and surrounding states, c. 1625. Traditionally, the Yoruba people viewed themselves as the inhabitants of a united empire, in contrast to the situation today, in which "Yoruba" is the cultural-linguistic designation for speakers of a language in the Niger–Congo family. The name comes from a Hausa word to refer to the Oyo Empire. The first Yoruba state was Ile-Ife, said to have been founded around 1000 CE by a supernatural figure, the first oni Oduduwa. Oduduwa's sons would be the founders of the different city-states of the Yoruba, and his daughters would become the mothers of the various Yoruba obas, or kings. Yoruba city-states were usually governed by an oba and an iwarefa, a council of chiefs who advised the oba. By the 18th century, the Yoruba city-states formed a loose confederation, with the Oni of Ife as the head and Ife as the capital. As time went on, the individual city-states became more powerful with their obas assuming more powerful spiritual positions and diluting the authority of the Oni of Ife. Rivalry became intense among the city-states. The Kwa Niger–Congo speaking Edo people. By the mid-15th century, the Benin Empire was engaged in political expansion and consolidation. Under Oba (king) Ewuare (c. 1450–1480 CE), the state was organised for conquest. He solidified central authority and initiated 30 years of war with his neighbours. At his death, the Benin Empire extended to Dahomey in the west, to the Niger Delta in the east, along the west African coast, and to the Yoruba towns in the north. Ewuare's grandson Oba Esigie (1504–1550) eroded the power of the uzama (state council) and increased contact and trade with Europeans, especially with the Portuguese who provided a new source of copper for court art. The oba ruled with the advice from the uzama, a council consisting of chiefs of powerful families and town chiefs of different guilds. Later its authority was diminished by the establishment of administrative dignitaries. Women wielded power. The queen mother who produced the future oba wielded immense influence. The Igbo primarily lived east of the delta (but with the Anioma on the west of the Niger River). The Kingdom of Nri rose in the 10th century CE, with the Eze Nri being its leader. It was a political entity composed of villages, and each village was autonomous and independent with its own territory and name, each recognised by its neighbours. Villages were democratic with all males and sometimes females a part of the decision-making process. Graves at Igbo-Ukwu (800 CE) contained brass artefacts of local manufacture and glass beads from Egypt or India, indicative of extraregional trade. The Aro Confederacy was a political union orchestrated by the Igbo subgroup, the Aro people, centered in the Arochukwu Kingdom in present-day south-eastern Nigeria. It was founded at the end of the 16th century, and their influence and presence was across Eastern Nigeria into parts of the Niger Delta and Southern Igala during the 18th and 19th centuries. Following the collapse of the Songhai Empire, a number of smaller states arose across West Africa, including the Bambara Empire of Ségou, the lesser Bambara kingdom of Kaarta, the Fula/Malinké kingdom of Khasso (in present-day Mali's Kayes Region), and the Kénédougou Empire of Sikasso. European traders first became a force in the region in the 15th century, with the 1445 establishment of a Portuguese trading post at Arguin Island, off the coast of present-day Senegal; by 1475, Portuguese traders had reached as far as the Bight of Benin. The transatlantic African slave trade began almost immediately after based on the already well established slave trading capacity serving the Islamic world, with the Portuguese taking hundreds of captives back to their country for use as slaves; however, it would not begin on a grand scale until Christopher Columbus's voyage to the Americas and the subsequent demand for cheap colonial labour. In 1510, the Spanish crown legalised the African slave trade, followed by the English in 1562. By 1650 the slave trade was in full force at a number of sites along the coast of West Africa, and over the coming centuries would result in severely reduced growth for the region's population and economy. The expanding Atlantic slave trade produced significant populations of West Africans living in the New World, recently colonised by Europeans. The oldest known remains of African slaves in the Americas were found in Mexico in early 2006; they are thought to date from the late 16th century and the mid-17th century. As the demand for slaves increased, some African rulers sought to supply the demand by constant war against their neighbours, resulting in fresh captives. States such as Dahomey (in modern-day Benin) and the Bambara Empire-based much of their economy on the exchange of slaves for European goods, particularly firearms that they then employed to capture more slaves. Moreover, during colonial rule both British and Dutch authorities were active in recruiting African slaves into the national military service. As it was believed that African black population was more immune than Europeans to the tropical diseases present in India and Indonesia. Recruitment changed format after the Atlantic slave trade was abolished by European and American governments in 19th century. For instance, 1831 was the first year when only volunteers were accepted for the military service. Though slavery in the Americas persisted in some capacity even after it was prohibited; the last country to abolish the institution was Brazil in 1888. Descendants of West Africans make up large and important segments of the population in Brazil, the Caribbean, the United States, and throughout the New World. African Americans in several major US cities who took part in a genetic research study, concluded that their common ancestry originated most prominently in western Africa which is consistent with prior genetic studies and the history of slave trade. In 1725, the cattle-herding Fulanis of Fouta Djallon launched the first major reformist jihad of the region, overthrowing the local animist, Mande-speaking elites and attempting to somewhat democratise their society. A similar movement occurred on a much broader scale in the Hausa city-states of Nigeria under Uthman dan Fodio; an imam influenced by the teachings of Sidi Ahmed al-Tidjani, Uthman preached against the elitist Islam of the then-dominant Qadiriyyah brotherhood, winning a broad base of support amongst the common people. Uthman's Fulani Empire was soon one of the region's largest states, and inspired the later jihads of Massina Empire founder Seku Amadu in present-day Mali, and the cross-Sudan Toucouleur conqueror El Hadj Umar Tall. At the same time, the Europeans started to travel into the interior of Africa to trade and explore. Mungo Park (1771–1806) made the first serious expedition into the region's interior, tracing the Niger River as far as Timbuktu. French armies followed not long after. In 1774 it was noted that the extensive coastline and deep rivers of Africa had not been utilised for 'correspondence or commerce', yet maps in this ancient volume clearly show the "Gum Coast", "Grain Coast", "Ivory Coast", and "Gold Coast". Malachy Postlethwayt writes "It is melancholy to observe that a country, which has near ten thousand miles sea-coast, and noble, large, deep rivers, should yet have no navigation; streams penetrating into the very center of the country, but of no benefit to it, innumerable people, without knowledge of each other, correspondence, or commerce." In the Scramble for Africa in the 1880s the Europeans started to colonise the inland of West Africa, they had previously mostly controlled trading ports along the coasts and rivers. Samory Ture's newly founded Wassoulou Empire was the last to fall, and with his capture in 1898, military resistance to French colonial rule effectively ended. Following World War II, campaigns for independence sprung up across West Africa, most notably in Ghana under the Pan-Africanist Kwame Nkrumah (1909–1972). After a decade of protests, riots and clashes, French West Africa voted for autonomy in a 1958 referendum, dividing into the states of today; most of the British colonies gained autonomy the following decade. Ghana became the first country of sub-Saharan Africa to achieve independence in 1957, followed by Guinea under the guidance Sekou Touré the next year. Out of the 17 nations that achieved their independence in 1960, the Year of Africa, nine were West African countries. Many founding fathers of West African nations, like Nkrumah, Touré, Senghor, Modibo Keïta, Sylvanus Olympio, Félix Houphouët-Boigny, Siaka Stevens and Abubakar Tafawa Balewa, consolidated their power during the post-independence 1960s by gradually eroding democratic institutions and civil society. In 1973, Guinea-Bissau proclaimed its independence from Portugal, and was internationally recognised following the 1974 Carnation Revolution in Portugal. West African political history has been characterised by African socialism. Senghor, Nkrumah and Touré all embraced the idea of African socialism, whereas Houphouët-Boigny and Liberia's William Tubman remained suspicious of it. 1983 saw the rise of socialist Thomas Sankara, often titled the "Che Guevara of Africa", to power in Burkina Faso. Since independence, West Africa has suffered from the same problems as much of the African continent, particularly dictatorships, political corruption and military coups. At the time of his death in 2005, for example, Togo's Étienne Eyadéma was among the world's longest-ruling dictators. Inter-country conflicts have been few, with Mali and Burkina Faso's nearly bloodless Agacher Strip War being a rare exception. The region of West Africa has seen a number of civil wars in its recent past including the Nigerian Civil War (1967–1970), two civil wars in Liberia in 1989 and 1999, a decade of fighting in Sierra Leone from 1991–2002, the Guinea-Bissau Civil War from 1998–1999 and a recent conflict in Côte d'Ivoire that began on 2002 ending 2007 and a second conflict in 2010–11. After gaining full independence from the British Empire in 1963, Nigeria established the first republic. The republic was heavily influenced by British democracy and relied on majority rule. The first republic fell after a successful coup d'état led by southern Nigerian rebels on 15 January 1966. The fall of the first republic left behind apparent political division between North and South Nigeria. This led to the military governor of south-eastern Nigeria, Colonel Odumegwu Ojukwu, deeming that because of northern massacres and electoral fraud, the Southeast of Nigeria should be an independent state. The independent state became known as the Republic of Biafra. Northern Nigeria opposed the claim of southern secession. The Nigerian government called for police action in the area. The armed forces of Nigeria were sent in to occupy and take back the Republic of Biafra. Nigerian forces seized Biafra in a series of phases. The phases were, the Capture of Nsukka, the Capture of Ogoja, Capture of Abakaliki, and the Capture of Enugu. All of the perpetrated phases and campaigns were successful due to the advantaged army of Nigeria. By 1970, Biafraian general, Chukwuemeka Odumegwu, fled to the neighboring nation of Côte d'Ivoire. After the flee, Biafra, facing no other option, surrendered due to lack of resources and leadership. Biafra quickly united with the northern Nigeria on 15 January 1970. The conflict is estimated to have killed roughly 1 million people. The civil war began on 23 March 1991 as a result of an attempted overthrow against the administration of president, Joseph Saidu Momoh. The rebels went under the guise of the Revolutionary United Front (RUF) led by Foday Sankoh a previous army corporal. The Sierra Leoneian government called for action and soon the Sierra Leone Army (SLA) was sent in to control the situation and take back RUF occupied territory. By 1992 president Joseph Momoh was ousted by a successful military coup led by Captain Valentine Strasser. Capitan Strasser, soon established multi-party democratic elections in the region. On 18 January 2002, the civil war was officially ended by former president Kabbah. During the 11 year conflict, roughly 50,000 Sierra Leoneians were killed with 2,000,000 displaced. Before the civil war began, an attempted coup d'état took place led by military Brigadier General Ansumane Mané. Mané leading the coup, blamed the presidency of Joao Bernardo Vieira for the poverty and corruption of Guinea Bissau. President Vieira, controlling the armed forces, soon fired Mané from his position of Brigadier General. He was fired on charges of supplying Senegal rebels. On 7 June 1998, a second coup d'état began. The coup once again failed. Soon after, rebels received aid from the neighboring nations of Senegal and Guinea-Conakry. The conflict sparked a civil war. Many soldiers in the armed forces of Guinea-Bissau joined the side of the rebels. This was in part, due to the soldiers not being paid by the government. The rebels continued to fight from 1998 to 1999. President Vieira was ousted on 7 May 1999. By 10 May 1999, the war ended when President Vieira signed an unconditional surrender in a Portuguese embassy. Approximately 655 were killed as a result of the conflict. In the early 2000s, the Ivory Coast (also known as Côte d'Ivoire) experienced an economic rescission. The rescission began as a result of the previous economic boom crashing the economy as a whole. This led to the predominantly Muslim north and predominantly Christian south of the Ivory Coast becoming politically divided. The southern Ivory Coast was in control of the Ivorian government. The north however, was under the power of the rebel movement. The civil war between the two began officially on 19 September 2002 when rebels launched a series of attacks on the south. The city of Abidjan was primarily targeted. Northern rebels were successful in the attacks. As a result of the chaos, president Robert Guéï was killed in the rebellions. The south retailed with military action. France supported the south and sent 2500 soldiers to the region and called for United Nations action. French action in the area went under the guise and codename of Operation Unicorn. By 2004 most fighting in the region ceased. On 4 March 2007 the civil war official ended with the signing of a peace treaty. Traditional African medicine is a holistic discipline involving indigenous herbalism and African spirituality. Practitioners claim to be able to cure various and diverse conditions. Modern science has, in the past, considered methods of traditional knowledge as primitive and backward. Under colonial rule, traditional diviner-healers were outlawed because they were considered by many nations to be practitioners of witchcraft and declared illegal by the colonial authorities, creating a war against witchcraft and magic. During this time, attempts were also made to control the sale of herbal medicines. As colonialism and Christianity spread through Africa, colonialists built general hospitals and Christian missionaries built private ones, with the hopes of making headway against widespread diseases. Little was done to investigate the legitimacy of these practices, as many foreigners believed that the native medical practices were pagan and superstitious and could only be suitably fixed by inheriting Western methods. During times of conflict, opposition has been particularly vehement as people are more likely to call on the supernatural realm. Consequently, doctors and health practitioners have, in most cases, continued to shun traditional practitioners despite their contribution to meeting the basic health needs of the population. In recent years, the treatments and remedies used in traditional African medicine have gained more appreciation from researchers in Western science. Developing countries have begun to realise the high costs of modern health care systems and the technologies that are required, thus proving Africa's dependence to it. Due to this, interest has recently been expressed in integrating traditional African medicine into the continent's national health care systems. Disease has been a hindrance to human development in West Africa throughout history. The environment, especially the tropical rain-forests, allow many single cell organisms, parasites, and bacteria to thrive and prosper. Prior to the slave trade, West Africans strived to maintain ecological balance, controlling vegetation and game, and thereby minimising the prevalence of local diseases. The increased amount and intensity of warfare due to the slave trade meant that the ecological balance could not be sustained. Endemic diseases became epidemic in scale. Genetic mutations developed that provided increased resistance to disease, such as sickle cell, evident in the Kwa forest agriculturalists from c. 700 C.E., providing some protection from malaria. In the 1990s, AIDS became a significant problem for the region, particularly in Côte d'Ivoire, Liberia, and Nigeria. The onset of the HIV epidemic in the region began in 1985 with reported cases in Benin and Nigeri, and in nearby countries, such as Côte d'Ivoire, in subsequent years. AIDS was at first considered a disease of gay men and drug addicts, but in Africa it took off among the general population. As a result, those involved in the fight against HIV began to emphasize aspects such as preventing transmission from mother to child, or the relationship between HIV and poverty, inequality of the sexes, and so on, rather than emphasizing the need to prevent transmission by unsafe sexual practices or drug injection. This change in emphasis resulted in more funding, but was not effective in preventing a drastic rise in HIV prevalence. The global response to HIV and AIDS has improved considerably in recent years. Funding comes from many sources, the largest of which are the Global Fund to Fight AIDS, Tuberculosis and Malaria and the President's Emergency Plan for AIDS Relief. As of 2011[update], HIV prevalence in western Africa is lowest in Senegal and highest in Nigeria, which has the second largest number of people living with HIV in Africa after South Africa. Nigeria's infection rate relative to the entire population, however, is much lower (3.7 percent) compared to South Africa's (17.3 percent). Ebola virus disease, first identified in 1976, typically occurs in outbreaks in tropical regions of Sub-Saharan Africa, including West Africa. From 1976 through 2013, the World Health Organization reported 1,716 confirmed cases. The largest outbreak to date is the ongoing 2014 West Africa Ebola virus outbreak, which is affecting Guinea, Sierra Leone, Liberia and Nigeria The outbreak began in Guinea in December 2013, but was not detected until March 2014, after which it spread to Liberia, Sierra Leone, and Nigeria. The outbreak is caused by the Zaire ebolavirus, known simply as the Ebola virus (EBOV). It is the most severe outbreak of Ebola in terms of the number of human cases and fatalities since the discovery of the virus in 1976. As of 16 August 2014[update], the World Health Organization (WHO) reported a total of 2,240 suspected cases and 1,229 deaths (1,383 cases and 760 deaths being laboratory confirmed). On 8 August, it formally designated the outbreak as a public health emergency of international concern. This is a legal designation used only twice before (for the 2009 H1N1 (swine flu) pandemic and the 2014 resurgence of polio) and invokes legal measures on disease prevention, surveillance, control, and response, by 194 signatory countries. Various aid organisations and international bodies, including the Economic Community of West African States (ECOWAS), US Centers for Disease Control and Prevention (CDC), and the European Commission have donated funds and mobilised personnel to help counter the outbreak; charities including Médecins Sans Frontières, the Red Cross, and Samaritan's Purse are also working in the area. Famine has been an occasional but serious problem in West Africa. In 1680s, famine extended across the entire Sahel, and in 1738 half the population of Timbuktu died of famine. Some colonial "pacification" efforts often caused severe famine. The introduction of cash crops such as cotton, and forcible measures to impel farmers to grow these crops, sometimes impoverished the peasantry in many areas, such as northern Nigeria, contributing to greater vulnerability to famine when severe drought struck in 1913. For the middle part of the 20th century, agriculturalists, economists and geographers did not consider Africa to be famine prone – most famines were localized and brief food shortages. 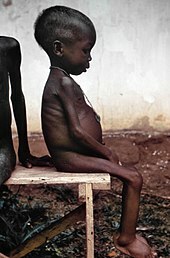 From 1967-1969 large scale famine occurred in Biafra and Nigeria due to a government blockade of the Breakaway territory. It is estimated that 1.5 million people died of starvation due to this famine. Additionally, drought and other government interference with the food supply caused 500 thousand Africans to perish in Central and West Africa. Famine recurred in the 1970s and 1980s, when the west African Sahel suffered drought and famine. The Sahelian famine was associated with the slowly growing crisis of pastoralism in Africa, which has seen livestock herding decline as a viable way of life over the last two generations. Since the start of the 21st century, more effective early warning and humanitarian response actions have reduced the number of deaths by famine markedly. That said, many African countries are not self-sufficient in food production, relying on income from cash crops to import food. Agriculture in Africa is susceptible to climatic fluctuations, especially droughts which can reduce the amount of food produced locally. Other agricultural problems include soil infertility, land degradation and erosion, swarms of desert locusts, which can destroy whole crops, and livestock diseases. The Sahara spreads up to 30 miles per year. The most serious famines have been caused by a combination of drought, misguided economic policies, and conflict. Recent famines in Africa include the 2005–06 Niger food crisis, the 2010 Sahel famine, and in 2012, the Sahel drought put more than 10 million people in the western Sahel at risk of famine, according to the Methodist Relief & Development Fund (MRDF), due to a month-long heat wave. West African peoples were trading with the Arab world centuries before the influence of Europeans. Spices such as cinnamon were introduced and became part of the local culinary traditions. Centuries later, the Portuguese, French and British further influenced regional cuisines, but only to a limited extent. However, as far as is known, it was European explorers and slaves ships who brought chili peppers and tomatoes from the New World, and both have become ubiquitous components of West African cuisines, along with peanuts, corn, cassava, and plantains. In turn, these slave ships carried African ingredients to the New World, including black-eyed peas and okra. Around the time of the colonial period, particularly during the Scramble for Africa, the European settlers defined colonial borders without regard to pre-existing borders, territories or cultural differences. This bisected tribes and created colonies with varying culinary styles. As a result, it is difficult to sharply define, for example, Senegalese cuisine. Although the European colonists brought many new ingredients to the African continent, they had relatively little impact on the way people cook in West Africa. Its strong culinary traditions lives on despite the influence of colonisation and food migration that occurred long ago. ^ American Geophysical Union. "Sahara's Abrupt Desertification Started By Changes In Earth's Orbit, Accelerated By Atmospheric And Vegetation Feedbacks". ScienceDaily. ScienceDaily. Retrieved 19 August 2014. ^ Tishkoff et al., Whole-mtDNA Genome Sequence Analysis of Ancient African Lineages, Molecular Biology and Evolution, vol. 24, no. 3 (2007), pp.757-68. ^ Miller, Duncan E.; Van Der Merwe, Nickolaas J. (March 1994). "Early Metal Working in Sub Saharan Africa". Journal of African History. 35 (1): 1–36. doi:10.1017/S0021853700025949. ^ Stuiver, Minze; Van Der Merwe, Nicholas J. (February 1968). "Radiocarbon Chronology of the Iron Age in Sub-Saharan Africa". Current Anthropology. 9 (1): 48–62. doi:10.1086/200878. Lay summary. ^ Bocoum, Unesco. Ed. by Hamady (2004). The Origins of Iron Metallurgy in Africa : new light on its antiquity ; West and Central Africa (PDF). Paris: UNESCO. ISBN 92-3-103807-9. Retrieved 23 August 2014. ^ Miller, Duncan E.; Van Der Merwe, N.J. (1994). "Early Metal Working in Sub Saharan Africa". Journal of African History. 35: 1–36. doi:10.1017/s0021853700025949. ^ Gravrand, Henry: "La Civilization Sereer – Pangool". Published by Les Nouvelles Editions Africaines du Senegal. 1990. pp, 9, 20 & 77. ISBN 2-7236-1055-1. ^ "Stone Circles of Senegambia". UNESCO. Retrieved 24 August 2014. ^ "Ancient Ghana". BBC World Service. BBC. Retrieved 24 August 2014. ^ "Atlas of the Human Journey". The Genographic Project. Archived from the original on 7 February 2010. Retrieved 10 January 2009. ^ Stride, G.T. & C. Ifeka (1971). Peoples and Empires of West Africa: West Africa in History 1000–1800. Edinburgh: Nelson. ISBN 0-17-511448-X. ^ Monteath, Archibald; Maureen Warner-Lewis (2007). Archibald Monteath: Igbo, Jamaican, Moravian. University of West Indies Press. p. 26. ISBN 9-766-40197-7. ^ Chuku, Gloria (2005). Igbo women and economic transformation in southeastern Nigeria, 1900-1960. Routledge. p. 7. ISBN 0-415-97210-8. ^ Martin, Phyllis M. and O'Meara, Patrick(1995). p. 95. ^ "Skeletons Discovered: First African Slaves in New World". 31 January 2006. LiveScience.com. Retrieved 27 September 2006. ^ Baten, Jörg (26 September 2011). "The Biological Standard of Living in Early 19th-Century West Africa: New Anthropometric Evidence". The Economic History Review. 65 (4): 1280–1302. ^ a b Postlethwayt, Malachy (1774). Universal Dictionary of Trade and Commerce (4th ed.). London: W. Strahan, J. and R. Rivington et al. "A New and Correct Map of the Coast of Africa from Cape Blanco to the Coast of Angola"
^ a b "1960-2010: 50 years of 'African independences'". onafrica. 4 January 2010. Retrieved 20 August 2014. ^ Adekeye Adebajo (1 January 2002). Building Peace in West Africa: Liberia, Sierra Leone, and Guinea-Bissau. Lynne Rienner Publishers. pp. 23–24. ISBN 978-1-58826-077-2. ^ African Socialism (1 January 1964). African Socialism. Stanford University Press. pp. 2–3. ISBN 978-0-8047-0203-4. ^ Dörrie, Peter (15 October 2012). "25 Years On: The Mixed Legacy of Burkina Faso's Thomas Sankara, Socialist Soldier". Think Africa Press. Archived from the original on 9 October 2014. Retrieved 20 August 2014. ^ "Nigerian Civil War". war-memorial.net. The military governor of the Igbo-dominated south-east, Colonel Odumegwu Ojukwu, citing the northern massacres and electoral fraud, proclaimed with southern parliament the secession of the south-eastern region from Nigeria as the Republic of Biafra, an independent nation. ^ "The Nigerian Civil War, Causes, Strategies, And Lessons Learnt". africamasterweb.com. Archived from the original on 12 March 2008. Retrieved 29 December 2014. ^ "Nigerian Civil War (1967-1970)". blackpast.org. The Nigerian Army however continued to slowly take territory, and on January 15, 1970, Biafra surrendered when its military commander General Chukwuemeka Odumegwu Ojukwu fled to Cote d’Ivoire. ^ "Sierra Leone profile". BBC. Retrieved 29 December 2014. 1991 - Start of civil war. Former army corporal Foday Sankoh and his Revolutionary United Front (RUF) begin campaign against President Momoh, capturing towns on border with Liberia. ^ "Sierra Leone Civil War". britannica.com. Retrieved 29 December 2014. An official end to the civil war was declared in January 2002. By that time, it was estimated that at least 50,000 people had died, with hundreds of thousands more affected by the violence and some 2,000,000 people displaced by the conflict. ^ "Guinea-Bissau Civil War: CAUSES OF CONFLICT". historyguy.com. Retrieved 28 December 2014. Former Brigadier General Ansumane Mane attempted a coup against President Joao Bernardo Vieira, who has ruled Guinea-Bissau since 1980. Mane accused the President of corruption and leading the nation into poverty. Vieira fired Mane from command of the armed forces on charges of selling weapons to the Casamance rebels of southern Senegal. ^ "Guinea-Bissau profile - Timeline". BBC. Retrieved 28 December 2014. ^ "Guinea-Bissau". encyclopedia.com. Retrieved 28 December 2014. ^ "What's causing the conflict in Ivory Coast?". CNN. Retrieved 28 December 2014. ^ "Guéï, Robert 1941–2002". encyclopedia.com. Retrieved 28 December 2014. ^ a b c d Helwig, David (4 February 2010). "Traditional African medicine". Encyclopedia of Alternative Medicine. Retrieved 4 February 2010. ^ a b c "Medicinal Plants and Natural Products" (PDF). Conserve Africa. Conserve Africa Foundation. 4 May 2002. Archived from the original (PDF) on 2006-10-07. Retrieved 4 February 2010. ^ Akyeampong, Emmanuel Kwaku, ed. (2006). "Disease in West African History". Themes in West Africa's history. Athens, Ohio [u.a. ]: Ohio Univ. Press [u.a.] pp. 186–207. ISBN 0821416405. ^ "2008 Country Profile: Cote d'Ivoire". U.S. Department of State. 2008. Retrieved 19 August 2014. ^ Elizabeth Pisani (3 Sep 2011). "HIV Today". New Scientist. , pp. iv-v.
^ "A Timeline of AIDS". AIDS.gov. Retrieved 28 January 2014. ^ "Prevalence of HIV, total (% of population ages 15-49)". ^ a b "Ebola virus disease Fact sheet N°103". World Health Organization. 1 March 2014. Retrieved 12 April 2014. ^ "Ebola Viral Disease Outbreak — West Africa, 2014". CDC. 27 June 2014. Retrieved 26 June 2014. ^ "CDC urges all US residents to avoid nonessential travel to Liberia, Guinea and Sierra Leone because of an unprecedented outbreak of Ebola". CDC. 31 July 2014. Retrieved 2 August 2014. ^ "Outbreak of Ebola in Guinea, Liberia and Sierra Leone". CDC. 4 August 2014. Retrieved 5 August 2014. ^ Roy-Macaulay, Clarence (31 July 2014). "Ebola Crisis Triggers Health Emergency". Drug Discov. Dev. Highlands Ranch, CO, US: Cahners Business Information. Associated Press. Retrieved 3 August 2014. ^ "Chronology of Ebola Hemorrhagic Fever Outbreaks". Centers for Disease Control and Prevention. 24 June 2014. Retrieved 25 June 2014. ^ "2014 Ebola Outbreak in West Africa". Centers for Disease Control and Prevention. Retrieved 24 August 2014. ^ "Statement on the Meeting of the International Health Regulations Emergency Committee Regarding the 2014 Ebola Outbreak in West Africa". World Health Organization. 8 August 2014. Retrieved 8 August 2014. ^ Dopplick, Renée (29 April 2009). "Swine Flu: Legal Obligations and Consequences When the World Health Organization Declares a "Public Health Emergency of International Concern"". Inside Justice. Retrieved 6 June 2014. ^ Nossiter, Adam (28 July 2014). "Fear of Ebola Breeds a Terror of Physicians". The New York Times. Retrieved 29 July 2014. ^ David Tenenbaum (1986). "Traditional drought and uncommon famine in the Sahel". Whole Earth Review, Summer. Retrieved 19 August 2014. ^ "Ekklesia | Methodists make appeal for famine threatened West Africa". ekklesia.co.uk. 2010-07-06. Retrieved 2018-12-17. Collins, Robert O.; Burns, James M. (2007). A History of Sub-Saharan Africa. Cambridge University Press. ISBN 9780521867467. Davidson, Basil (1971). Great Ages of Man: African Kingdoms. New York, NY: Time Life. LCCN 66-25647. Davidson, Basil (1991). Africa in History. New York, NY: Macmillan. Ehret, Christopher (2002). The Civilizations of Africa. University Press of Virginia. Ham, Anthony (2009). West Africa. Lonely Planet. ISBN 1-74104-821-4. Iliffe, John (2007). Africans: The History of a Continent. African Studies. 108 (2nd ed.). Cambridge University Press. ISBN 9781139464246. Laporte, L.; Bocoum, H.; Cros, J.‑P. ; Delvoye, A.; Bernard, R.; Diallo, M.; Diop, M.; Kane, A.; Dartois, V.; Lejay, M.; Bertin, F.; Quesnel, L. (June 2012). Carver, Martin, ed. "Megalithic monumentality in Africa: from graves to stone circles at Wanar, Senegal" (PDF). Antiquity. Antiquity Publications Ltd. 86 (332): 409–427. Retrieved 22 August 2014. Onwuanibe, Richard C. (1979). "The philosophy of African medical practice". A Journal of Opinion. African Studies Association. 9 (3): 25–28. JSTOR 1166259. Shillington, Kevin (2005). History of Africa (2nd ed.). Palgrave Macmillan. ISBN 9780333599570. Speth, Peter (2010). Impacts of Global Change on the Hydrological Cycle in West and Northwest Africa. Springer. ISBN 3-642-12956-0. Tishkoff, S. A.; Reed, Floyd A.; Friedlaender, Françoise R.; Ehret, Christopher; Ranciaro, Alessia; Froment, Alain; Hirbo, Jibril B.; Awomoyi, Agnes A.; Bodo, Jean-Marie; Doumbo, Ogobara; Ibrahim, Muntaser; Juma, Abdalla T.; Kotze, Maritha J.; Lema, Godfrey; Moore, Jason H.; Mortensen, Holly; Nyambo, Thomas B.; Omar, Sabah A.; Powell, Kweli; Pretorius, Gideon S.; Smith, Michael W.; Thera, Mahamadou A.; Wambebe, Charles; Weber, James L.; Williams, Scott M. (2009). "The genetic structure and history of Africans and African Americans" (PDF). Science. 324 (5930): 1035–1044. doi:10.1126/science.1172257. PMC 2947357. PMID 19407144. Timberlake, L. (14 September 1985). The Sahel: drought, desertification and famine. Draper Fund Report.